Do you know all the possibilities? Unique is the keyword in these unique baby gifts. 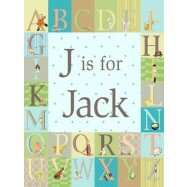 We have a beautiful assortment of artwork that is made even more special by adding your newborn’s name. A personalized growth chart is definitely a gift that grows with your child. 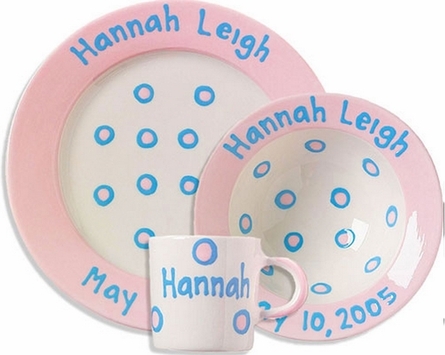 Make a child’s first birthday extra special with a plate, bowl, cup set. It is something they can use everyday and will someday become an heirloom. What is more special than a keepsake that a child can keep forever? 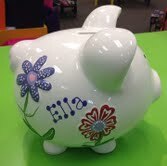 Most of these gifts take some lead time to special order, but we personalize Piggy Banks right away in our stores. They are perfect for unique names. Another great gift is our handmade Music Box, perfect for the child that has everything. Birthday Bins make parties easy for everyone. Do you know about our birthday bins? Does your child have a birthday coming up? 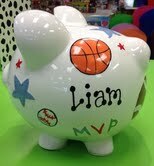 Come into one of our stores and we will give you a plastic bin that your child fills with all the things they want. We give you an enclosure to add to your birthday invitations, letting their friends know where to go to pick out a gift. 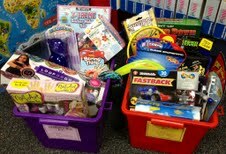 It is easy for you because your child gets what they want and it’s easy for their friends to choose the right gift. Everyone wins! Don’t forget about our party favor bags. Come in and pick out treats to fill our complimentary goodie bags or let us pick them out for you. You’re all dressed up for the party, why not dress up the gift? Have us personalize one of our totes for you. We have many different sizes and styles. All you have to do is pick out what you want to go in it and give us the child’s name and we’ll do the rest. We add all of your choices to the personalized container and wrap it up in cellophane. We finish it off with ribbons and our colorful scrunch. It will definitely be the “Wow” gift of the party! So get the party started. 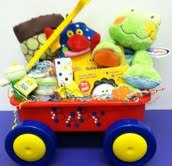 Come in to Kiddly Winks today to see what we can do for you! What makes Kiddly Winks special? Toy Fair 2014! Great blog….fun ideas… Thank you Kiddly Winks!!!! Thanks! Call us any time! We have lots more ideas too!